بهترین درجه حرارت هوا برای کشت خیار بین 20-29 درجه و شبها حداقل 15 درجه کمتر نباشد . و درجه حرارت در روز نیز بیش از 30 درجه نباشد چراکه سبب کاهش کیفیت و کمیت محصول خواهد شد . چنانچه تغییرات هوا خیلی متغیر باشد کشت گلخانه ای توصیه میشود . نور نیز نظیر درجه حرارت اهمیت فوق العاده ای در جذب اب و مواد غذائی خواهد داشت . آزمایشات انجام شده نشان میدهد نور علاوه بر افزایش فتوسنتز در خیار سبب افزایش جذب ازت و پتاسیم بوده است . خیار برعکس گوجه فرنگی دارای ریشه افشان سطحی است که حدود 20-15 سانتیمتر خاک سبک نیاز دارد . در چنین خاکی با هوادار شدن آن خیار رشد خیلی خوبی خواهد داشت . خیار به آب و خاکهای شور حساس است روی این اصل کشت و کار در چنین خاکهایی پیشنهاد نمی شود . Cherry tomatoes are a very popular vegetable to grow for folks who are short on yard space. These little bushy plants are ideal for balconies, patios or even windowsills. Average cherry tomatoes are about an inch across, but there are varieties like Tiny Tim that produce tomatoes about half that size. 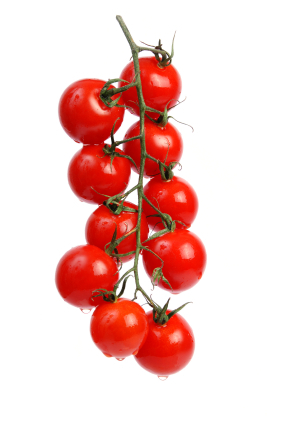 Not only do cherry tomatoes take up less space, they also mature quicker than full-sized tomatoes. Most people grow bush varieties, but you can get vining cherry tomatoes such as Gardener’s Delight. Vining cherry tomatoes can grow fairly large, and may require as much space as a typical tomato, so do a bit of research into the many varieties before making any purchases of seeds or seedlings. For small plants, stick with the bush. or cooked, but the smaller cherry tomatoes are more often eaten raw just because of their size. They are high in vitamins A and C, and are great sources for potassium, vitamin K and even fiber. اشخاص حقیقی و حقوقی اعم از دولتی ، تعاونی یا خصوصی كه قصد انجام فعالیت در زمینه تولید محصولات گلخانه ای و قارچ خوراكی را دارند موظفند نسبت به دریافت مجوز و هرگونه پروانه نظیر پروانه تأسیس ، بهره برداری ، توسعه ، بازسازی و نوسازی اقدام نمایند . ـ در مورد اراضی دارای سند مالكیت ارائه بنچاق ، اصل اسناد مالكیت به همراه یك نسخه تصویر آن (فتوكپی برابر اصل مدارك) ضروری است. تبصره 1 : در مورد زمین های اوقافی و آستانه ای مدت و موضوع اجاره بر اساس نظریه اداره اوقاف شهرستان یا استان مربوطه تعیین می گردد. تبصره 2 : در مورد اراضی فاقد سند مالكیت (اراضی واگذاری مدیریت اموراراضی و منابع طبیعی) مدارك واگذاری و موافقت نامه اجرای طرح توسط ارگان های ذیربط الزامی است . تبصره 3 : با توجه به اینكه احداث گلخانه ها تغییر كاربری محصول نمی شود لذا در راستای تبصره 4 الحاقی به ماده یك قانون اصلاح قانون حفظ كابری اراضی زراعی و باغ ها ، رعایت ضوابط زیست محیطی و رعایت بخشنامه 87399/020/53 مورخه 14/9/86 سازمان اموراراضی ضروری می باشد . ـ یك نسخه از انحصار وراثت در مورد زمین های موروثی دال بر مالكیت متقاضی و ارائه وكالت نامه بلاعزل از سایر وراث به متقاضی و همچنین اجاره نامه محضری مدت دار. ـ ارائه تعهدنامه محضری به منظور عدم ساخت بناهای غیرمجاز و عدم تغییر كاربری اراضی به مدیریت اموراراضی استان. ـ ارائه پاسخ مثبت استعلامهای مورد نیاز. ـ ارائه كروكی تأییدشده توسط مهندس ناظر سازمان نظام مهندسی استان جهت تعیین دقیق مكان احداث گلخانه یا واحد قارچ خوراكی با رعایت حریم های مربوطه . ـ زمین متقاضی باید دارای اسناد مثبته و فاقد معارض باشد. ـ در خصوص اراضی واگذاری از سوی هیأت های هفت نفره واگذاری زمین یا كمیسیون ماده 31 و 32 قانون واگذاری اراضی ملی و دولتی ، ارائه صورتجلسه واگذاری زمین و همچنین نقشه و كروكی مورد نظر جهت صدور پروانه الزامی است . تبصره 4 : امكان احداث واحدهای پرورش قارچ دكمه ای در زمینهای استیجاری وجود ندارد . ـ در مورد اراضی دارای سند ، ارائه فتوكپی نقشه تفكیكی پلاك اصلی كه پلاك های فرعی درآن مشخص شده و به تأیید اداره ثبت اسناد شهرستان رسیده باشد. Best Management Practices are the best recommended practices for growing a specified crop. These recommended practices are based on research and experience and apply to the specified crop under the specified conditions. These recommended BMPs are not the only way to grow a crop but are the best way determined by the author of the BMP. The BMP may change as additional research becomes available. Self-nursery or in commercial nursery. Mother plants must be prepared and ordered in January to transplant in April. Mother plants must be free of diseases, preferably produced in a meristem nursery. End of September and beginning of October, depending on variety. Use suitable sandy and light soils for strawberry production. Plow soil to depth of 40-50 cm. Sterilize soil by methyl bromide, 50 kg per dunam. Establish seed beds, height 15-20 cm. Seed beds spaced 115 cm apart. Plant spacing in the row is 50 cm. Before planting, spray Ronstar or Goal herbicide on the seed beds to avoid seed weed germination. After spraying, supply 15-20 m3/water per dunnam to leach the chemicals into the soil by using microsprinklers. Per one seed bed, 4 rows of plants, allowing 25 cm between rows. Allow 25-27 cm between plants in the row. In general, the number of plants per dunam is about 8,500-9,000 plants. Use complete fertilizer N:P:K* with microelements like 5:3:8 or 7:3:7. Start with one liter per day/dunam, increasing to 2 liters per day/dunam in season. It is important that strawberries have good ventilation to avoid diseases. Open the plastic tunnel at every opportunity. Keep the plastic closed only on rainy days. Pick strawberries every 2-3 days. Pick strawberries carefully by hand to avoid injury of the fruit. Harvesting is continuous for 5-6 months, normally beginning in December until the end of May. Strawberry fruit is very sensitive; it needs to be marketed immediately after picking. It can be stored at 4°C for a few days. - Use colored plastic for mulching, preferably shiny plastic. If there is danger of seed weed germination, use black plastic for mulching.